These “pickles” are tangy and spicy, boozy and complex. They taste nothing like any other pickle I’ve ever had (and I mean that in a good way). 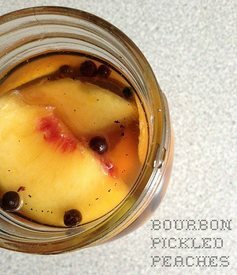 I made these pickles a few days ago, and ever since then I’ve been dreaming up all the things I can DO with bourbon pickled peaches. Obviously, I’ll eat a lot of them straight out of the jar. I’ll toss some of them in salads or mix them into a vinaigrette. I’ll include them on antipasti platters and charcuterie boards.